Gastroenterology Unit, Department of Child Health, Sultan Qaboos University Hospital, Al-Khoud, Muscat, Sultanate of Oman. *address correspondence and reprints request to: Siham Al Sinani, Gastroenterology Unit, Department of Child Health, Sultan Qaboos University Hospital, Al-Khoud, Muscat, Sultanate of Oman. Al Sinani S. RE: Celiac Disease Prevalence in Omani Children with Type 1 Diabetes Mellitus. Oman Med J 2013 Nov; 28(6);460. In the September issue of Oman Medical Journal, Al-Mendalawi,1 had a few valid points to discuss regarding a previously published manuscript: Prevalence of celiac disease in Omani children with type 1 diabetes mellitus: A cross sectional study,2 which was an observational type study. In general, observational studies are commonly used to describe the prevalence of a disease in a certain population where a sample of people is studied and information is recorded in a systematic manner. It is clearly indicated in the manuscript that children with T1DM were screened prospectively over a one year period; therefore, there is minimal recall error that was considered by Al-Mendalawi to be a possible etiology in underestimating the prevalence down to 5.5% and presumption that prevalence could be higher based on study error, which in fact was not. Most of our patients were not screened at diagnosis of T1DM. 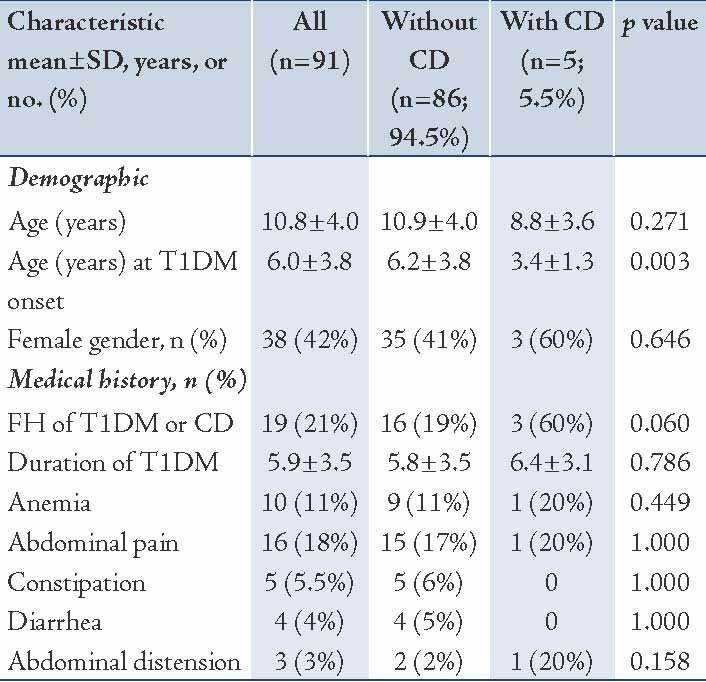 Table 1 indicates that the duration of T1DM was 5.9 ± 3.5 years, which indicates that few years lapsed between T1DM diagnosis and CD screening. This, once again, might reflect a true prevalence rather than a study error. n: number; SD: standard deviation; FH: family history. I would agree that a cohort, or "longitudinal", or "prospective" studies that extend over time allow one to study changes and to establish the time-sequence in which things occur. But in general, one cannot estimate the prevalence from a cohort study. Cohort studies are generally used to identify causal factors for a disease, which in our study, was not the purpose. Understanding the limitations that might influence studies conducted at one center, we suggested that conclusions from our study need to be solidified by a larger national level study. Based on international guidelines for CD diagnosis, treatment and follow-up,3 this study based CD diagnosis on anti-tTGA as well as other highly sensitive and specific antibodies (EMA). Realizing the false negatives and false positives for any test, these considerations are all described clearly in the manuscript and proposed ways to overcome them are also illustrated.4 Studies mentioned by Al-Mendalawi,1 are significant and were referenced in our manuscript.4 As most guidelines indicate, all children with T1DM and negative CD screen in our institution are followed annually to detect their seroconversion, even if they are asymptomatic (silent CD). We are currently working on reporting their risk to develop CD over time. 1. Al-Mendalawi MD. Prevalence of celiac disease in omani children with type 1 diabetes mellitus: a cross sectional study. Oman Med J 2013 Sep;28(5):375. 2. Al-Sinani S, Sharef SW, Al-Yaarubi S, Al-Zakwani I, Al-Naamani K, Al-Hajri A, et al. Prevalence of celiac disease in omani children with type 1 diabetes mellitus: a cross sectional study. Oman Med J 2013 Jul;28(4):260-263. 3. Husby S, Koletzko S, Korponay-Szabó IR, Mearin ML, Phillips A, Shamir R, et al; ESPGHAN Working Group on Coeliac Disease Diagnosis; ESPGHAN Gastroenterology Committee; European Society for Pediatric Gastroenterology, Hepatology, and Nutrition. European Society for Pediatric Gastroenterology, Hepatology, and Nutrition guidelines for the diagnosis of coeliac disease. J Pediatr Gastroenterol Nutr 2012 Jan;54(1):136-160. 4. Larsson K, Carlsson A, Cederwall E, Jönsson B, Neiderud J, Jonsson B, et al; Skåne Study Group. Annual screening detects celiac disease in children with type 1 diabetes. Pediatr Diabetes 2008 Aug;9(4 Pt 2):354-359.